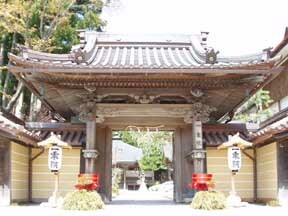 Temple Lodging in Japan "Ichizyo-in"
Located in the center of Mount Koya, it is very convenient to walk around the city from this temple. Yet, in the inside of the shukubo, there is a pure and serene space where you can enjoy the taste of wooden architecture. 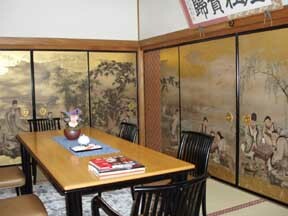 What is surprising upon entering the shukubo is the beauty of the interior ornaments and the room itself. On the sliding screens along the corridor, you will see the world of mountain hermits painted by Tansai Kano. It is a painting of the hermits indulging in writing poetry and playing Go, etc. On the opposite side, a Penglaishan type garden spreads out. 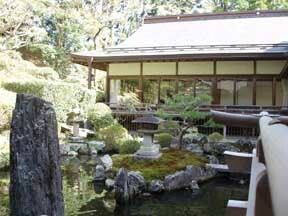 It is a garden with a pond in which stones are arranged to imply a crane and a turtle. The room we stayed in was in the new building. It is a beautiful wooden building and yet it is equipped with internet facilities, a bath and a lavatory. It was a really nice room. The TV was a thin LCD. The room had a kotatsu heater and a refrigerator as well. (I hear that not all the rooms have a refrigerator.) Also, a towel and a bath towel, a yukata robe and a tooth brush are provided. 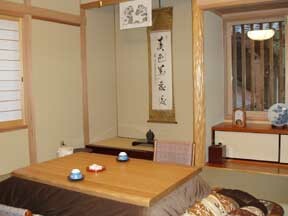 The shukubo has such a genteel appearance and excellent facilities exceeding the expensive Japanese style inns that we see everywhere. 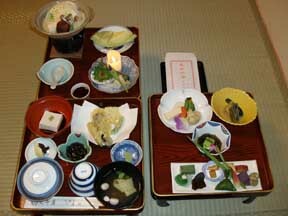 The meals are shojin vegetarian cuisine and you can have them in your room. A student priest brought the dishes with quick and light movements, which had a sobering effect on me. The meal was so large in volume, even for a man like me, that I left the dessert (which was a slice of melon) and ate it later. I don't think a woman could eat it all. It was tasty and what is more, it was well produced. For example, a candle was lit in a piece of radish. It is difficult to find such a beautiful shojin cuisine. The colorful dishes included sesame tofu which was bouncy and delicate in taste, shojin tempura such as green pepper, light tasting cooked vegetables, hotpot seasoned with white miso, cooked winter melons with sesame miso, gluten dumplings, sweet dried plums, tansy gluten and purple sweet potato, etc. After the meal, I experienced shakyo. 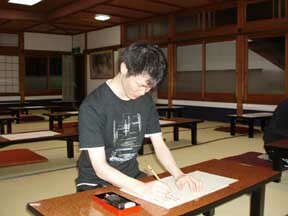 I was guided to the shakyo room on the second floor and purified my hands with zuko (a kind of incense). After that, I ground an ink-cake to make ink and started writing using a brush. I copied the Heart Sutra. I followed the characters already written lightly on a piece of paper. I was able to smell the incense that burnt in the shakyo room. This is an esoteric meditation method similar to zazen. What is different from zazen, is that you are not intended to have nothing in your mind, but to fill your mind with good images. I was not able to control my mental images so easily, but when it was over after slowly breathing in the dim main hall, I felt that my body was filled with comfortable satisfaction. The people in the temple were nice and warm and they politely replied to various questions. 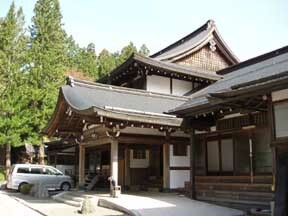 Thus I was able to spend a fulfilling day on Mount Koya.